The genus Hieraaetus, sometimes known as hawk-eagles, denoted a group of smallish eagles usually placed in the Buteoninae subfamily of accipitrids. The Booted Eagle (formerly Hieraaetus pennatus), Bonelli's Eagle (formerly H. fasciatus), the Little Eagle (formerly H. morphnoides) and the Rufous-bellied Eagle (formerly H. kienerii) have been determined by recent genetic research to be polyphyletic and clustered along with the eagles of the genus Aquila rather than to their traditional group. This creates a taxonomic problem: The Booted Eagle is the type species of Hieraaetus, making that name a junior synonym of Aquila. 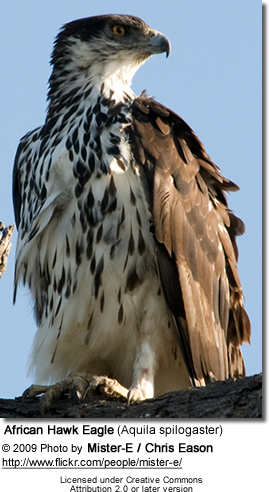 Consequently, should any hawk-eagles be retained as a distinct group, they need to get a different genus name. Sometimes the entire genus is merged into Aquila. That the remaining 3 species are probably still not a monophyletic group is apparent by their biogeography, which would quite implausibly require that a number of relatives living between Africa and New Guinea had become extinct prehistorically without leaving any trace or descendants. Christidis and Boles (2008) use an alternative approach. Accepting that both Aquila and Hieraaetus are polyphyletic, they move spilogaster and fasciatus with the Aquila genus and retain the other former Hieraaetus group along with morphnoides and Aquila wahlbergi within the new delimitation of Hieraaetus. Whether the fossil "Hieraaetus" edwardsi (Middle -? Late Miocene of SW Europe) belongs to the hawk-eagles proper (if there is such a thing) or into Aquila has not been determined. The Rufous-bellied Eagle (Hieraaetus kienerii) was found to be distinct and may well need to be assigned to a new genus. Collinson, M. Splitting headaches? Recent taxonomic changes affecting the British and Western Palaearctic lists - British Birds vol 99 (June 2006), 306-323.